Madeleine is the central female character. We meet her as she prepares to graduate, uncertain as to what to do with her life. She is from a privileged WASP background, passionate about the Victorian novel in an era when semiotics and deconstructionism are in fashion (the early 80’s). The novel moves back and forwards to cover Madeleine’s time at college and the couple of years afterwards, focussing on her relationships with Leonard and Mitchell, the two men in her life. The novel switches its narrative voice between these three characters, sometimes recounting the same events from two (or even three) perspectives. Leonard is brash, confident, super-intelligent and popular – a science major apparently destined for great things. Mitchell is sensitive, reflective and generally nice, prepared to be treated by Madeleine as a bit of a door mat – no less intelligent that Leonard, but less conspicuously so. While Leonard struggles with science and mental illness, Mitchell struggles with religious belief, which plays an analogous role in his life. Both love and want Madeleine – she has given herself to Leonard and he offers much in return, but for most of the novel it is clear that her heart lies with Mitchell. Until the final few pages the denouement of these tangled relationships remains unclear; don’t expect a neat Victorian ending! The Marriage Plot contains a good story with memorable and convincing characters. All of the characters love books and knowledge; there are a lot of references to other books and literary theory, which some readers may find challenging. There are convincing sections dealing with college life in the US in the early 80s, working in an unsympathetic research biology laboratory and working for Mother Theresa. There are very strong first and third person descriptions of the effects of both mania and depression. This is a book which ranges widely both in themes and geography. At over 400 pages it is a large book, but it never lags and I would happily have read more. Excellent literary fiction. One Comment on "The Marriage Plot"
I wanted to read this book so much. Can’t find time. 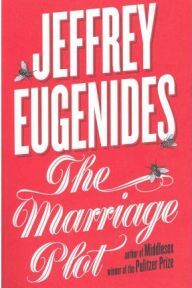 I like Middlesex and will aspire to read everything Eugenides has ever written. Thanks for the endorsement, can’t afford to miss this!